Emergency phones serve a very important purpose, but if you do not regularly test your phones, they may not be code compliant or even function safely and effectively. This blog covers how to easily test your phones to ensure functionality and compliance. As a property manager, we are sure that you are aware that it is required by law that you provide emergency phones within your elevators. Emergency pool phones are additionally required by law in many states. On top of this, many property managers host additional emergency phones on their properties including areas such as sidewalks, gyms, parking garages and stairwells, as they recognize the benefits of extra safety and reduced liability that these can provide. Our point here is that if you’re in the property management industry, you likely have at least one emergency phone on your property. You may think by simply having the emergency phone there that you are adhering to laws or providing the needed protection for your property, but there is always room for errors and malfunctions when it comes to technology, and if certain aspects of your emergency phone aren’t working correctly, this can lead to both code compliance and safety failures. This is why it is so important to regularly test your emergency phones. We know, we know, you’ve already got a lot on your plates. Luckily the testing process is a quick and easy one. See below for just how to do so. Your state enforces ASME A17.1 which requires a working emergency telephone or intercom for elevator emergency communications. The steps below will help you determine whether your emergency phone complies to this code. 1. Activate two or more elevator phones at the same time in order to determine that phones are able to hold a two-way conversation with emergency operator(s) simultaneously. If only one or none of the calls go through, one call is disconnected once the second one is made, the phones do not dial out or the parties cannot hear each other once the call is placed, this portion of the test is failed. 2. Ask the emergency phone operator if he/she is able to identify your cab numbers and location. If they are unable to do so, the emergency phone has failed this portion of the test. 3. 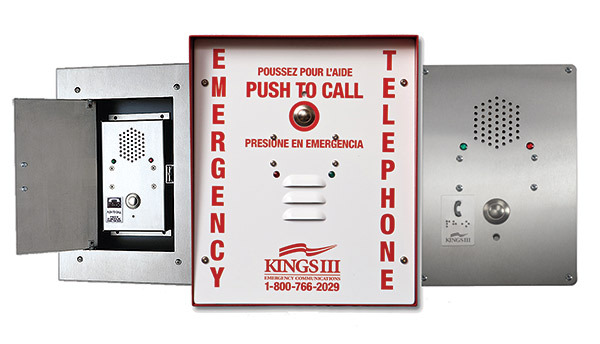 Use the emergency responder phone (usually located on the main egress level, in the fire control room or at a guard station) to call and test the on-site responder’s ability to directly call back into the elevators without delay. If the elevator phones cannot be called back properly, this indicates failure. If all above components function properly, you can rest easy knowing that your emergency phone will perform as expected in an emergency situation and complies to code. 1. Initiate a call from your elevator phone. If you are unable to connect, your emergency phone has failed this portion of the test. 2. If connected, tell your operator that you are performing a test and ask if they are able to hear you well. If they are able to do so, you are able to move on to the final portion of the test. 3. Ask the operator if they can identify your location. For ADA compliance, the most important requirement is that the emergency operator answering the call must be able to determine the exact location of the caller without the caller telling them. If the operator is unable to do so, the phone is not ADA compliant.